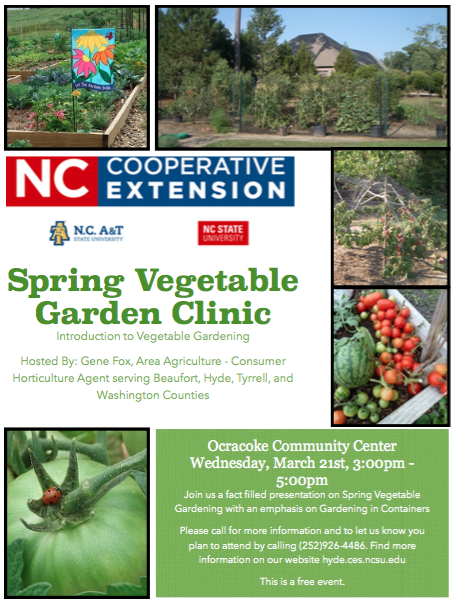 Join Gene Fox, Area Agriculture-Consumer Horticulture Agent to learn how to grow Vegetables in the home landscape. This will be an introductory class that will cover raised bed construction, container gardening, soils, growing from seed, planting dates, right plant for the right place, varieties that work in our zone, and where to find incredible resources. Gene will also take questions on growing vegetables or fruit in the home landscape. Please call Connie Burleson to register for this free class at (252)926-4486.